As a lot of people said this 50 dollar giftcard could go a long way. That could be the next contest to see how long and what they bought. I follow you by facebook. thanks for the updates. I hope I win. Great giveaway. Thank you! I would love to win! Love this card! Thanks for the giveaway. I love your site, thanks for the chance to win!! I liked TT on FB. I’d love the chance to win this. Target is one of my favorite stores. These WOW gift cards are so cute! Thanks for the giveaway!!! This would GC would sure help buying diapers and formula! Times are tough all over….sure would be a help to win this!!!! Thanks for the opportunity! Woo Hoo!!! Great offer. Thank you!!!! Thank you for the chance to win. Love your blog! Target is my FAVORITE store by far! Thanks so much for the chance to win! Im keeping my fingers crossed! I read TT everyday for great savings ty! Hope i win!! 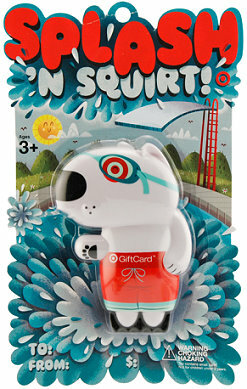 Fingers crossed, I love it when I can find squirters for my little one that don’t look like weapons! You are the QUEEN of gift cards, hands down!